Built by the U. S. Army, named Battery Crockett. Emplaced four 12" disappearing guns, capable of firing in any direction. A crew of 30 men was required to service each gun. The last of the four guns was still firing when the Japanese landed on May 5, 1942, and the gun crew removed its breech block prior to capture. , and a well-trained crew could get a round off every 40 seconds. 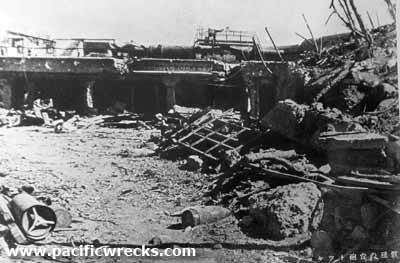 On 24 April 1942, a 240 mm howitzer, which had been moved from Cavite because it's high trajectory could seek out the guns in their protective pits, scored a direct hit and knocked out both of Crockett's guns. Even then, with the prospect of the guns falling into Japanese hands and being capable of being repaired, Captain Herman Hauck put a link of chain in the recoil cylinder of one of Crockett's operational 12-inch guns. If it were ever fired by the Japanese, it would have self-destructed immediately.